"Another obscure SNES title that deserves a second look...or perhaps a first." A ground breaking hit for the SNES series. 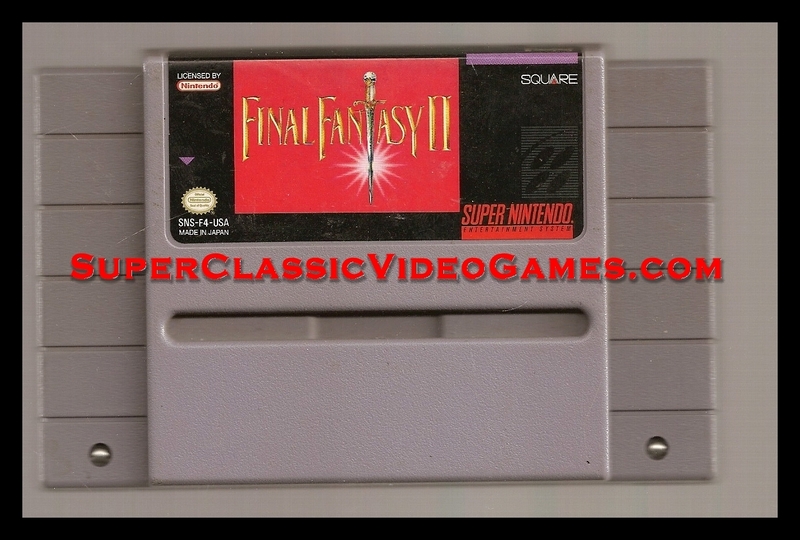 Final Fantasy 2 is, in my opinion, one of the top five SNES games out now. It has neither the depth of Final Fantasy 3 or the cool attacks of Chrono Trigger, but it's just as entertaining as those games in its own way. This follows the format of a standard RPG: you start out with a main character (Cecil), and throughout your quest characters join you and leave you. They also all gain experience points and thus energy and new attacks. There are three main worlds in the game, the Overworld, the Underworld and the Moon. The storyline is flawless, with many twists that you didn't see coming. This game is for one player only. Super Castlevania 4 is a rare game that is a well known but should be tried and that is getting much harder to find anymore. I do have a copy on my web site. WE HAVE FOR SALE MANY RARE NINTENDO SNES CARTRIDGES. ARE YOU LOOKING FOR A GREAT RARE NINTENDO SNES GAME FOR SALE? CHECK OUT OUR STORE INVENTORY. WE HAVE MANY NINTENDO SNES GAMES FOR SALE. MOST OF THEM ARE RARE AND ON SALE. SOME ARE NOT RARE BUT ARE STILL FUN TO PICK UP. WWW.SUPERCLASSICVIDEOGAMES.COM IS AN ONLINE VIDEO GAME STORE THAT HAS MANY RARE ITEMS ON SALE. YOU WILL FIND MANY RARE NINTENDO SNES GAMES FOR SALE ON MY SITE. WE NOT ONLY HAVE THE RARE GAMES ON SALE, BUT WE HAVE THE FUN AN COMMON GAMES. IT TRUELY IS A GREAT ONLINE EXPERIENCE. IF YOU ARE INTERESTED IN AN ITEM THEN CHECK OUT MY ONLINE STORE. WE ACCEPT PAYPAL AND HAVE MANY ITEMS IN STOCK. WE HAVE MANY CHEAP VIDEO GAMES FOR SALE. ALL OF THESE ARE USED CLASSIC NINTENDO SNES GAMES EXCEPT A FEW. THEY ARE CLASSICS AND WILL PLAY ON YOUR CLASSIC NINTENDO NES CONSOLE.